Hook and loop system holds securely for long disc. 8-hole pattern. Special coating reduces clogging, extends life. 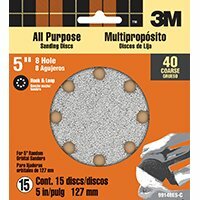 Fits most 5" disc dustless sanders. If you have any questions about this product by 3MProducts, contact us by completing and submitting the form below. If you are looking for a specif part number, please include it with your message.